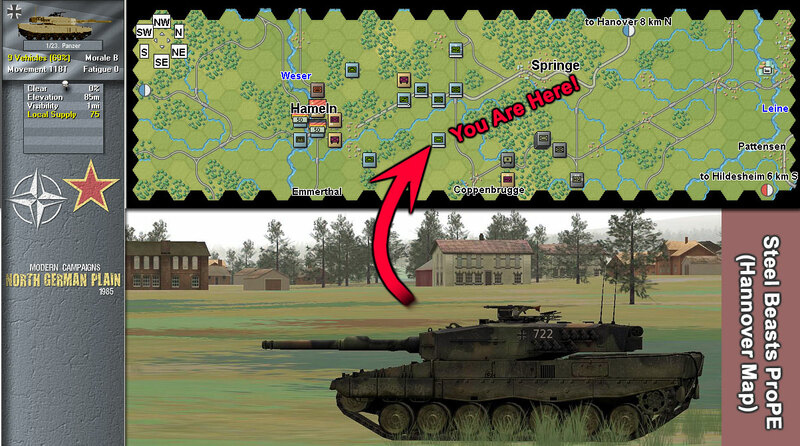 The tactical situation: Soviet forces try to capture a crossing over the Wesser River at the city of Hameln. NATO armored forces are tasked with retaking the bridges over the Wesser and to hold against the Soviet armored forces attempting to link up with the desants. I was playing the traditional turn based tactical/operational game North German Plain (map on the top of the image above) and got curious about how the attacks/defenses that are automatically resolved in the game would look and feel in the 3D world of Steel Beasts ProPE (pasted screenshot in the bottom of the image above). 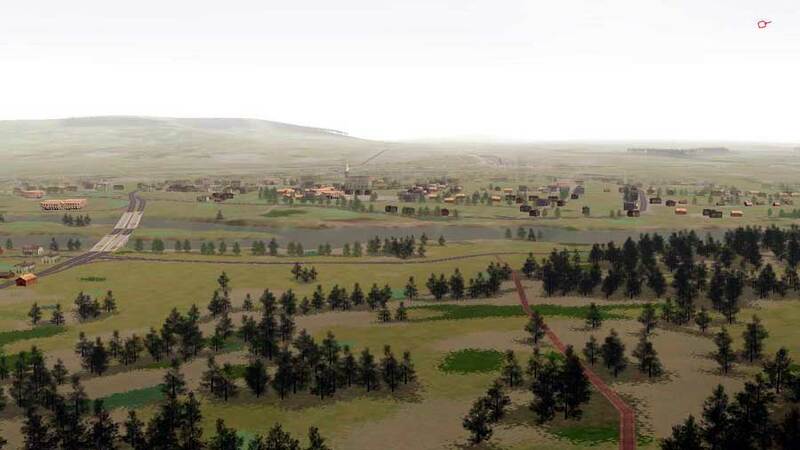 One of the maps in Steel Beasts ProPE covers the very area of the North German Plain scenario shown above. The expansive 3D world of Steel Beasts. The city of Hameln is surrounded by hills and woods. Note the two bridges on the right. Although it would be extremely cool, I'm not going to re-create the whole Hameln scenario into Steel Beasts ProPE. I'm going to focus on the armored NATO units moving into Hameln, particularly the ones north Coppenbrugge (see map in the first image above). A nice armor action is brewing there! IIRC the PzC games don't allow you to "edit" the results of an individual skirmish, right? Would be nice to be able to play each contact separately in SB and use the NGP map for the operational stuff. You are correct, contact is resolved automatically in Modern/Panzer Campaigns. Hi taps, thanks for the correction. I will edit the entry one of these days. Actually, you CAN customize the outcome of the result in NGP. The only thing you have to do is, open the NGP saved game file (.btl) and, if you know what to look for, you can text edit anything you want. You can change strengths of units in this way to match the result from the SB engagement. If you need more help with this then let me know. I love World War 2 games specially the Medal of Honor series. This is the first time I have learned about Steel Beasts ProPE, I would be playing this game if I get my hands on it. It has pretty cool graphics.